You can make heat sensitive adhesive bias tape from any materials you like. 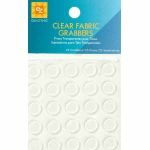 Clover Fusible Web 5mm width is suitable for use with this tape maker. 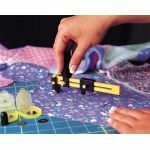 You simply place the heat sensitive tape in the upper groove and the fabric strip in the lower groove. By pulling the handle, the two are simultaneously fed through allowing you to iron them as they emerge from the tool. Your own customized bias tape made easily and quickly!